Gold Monetisation Scheme and Sovereign Gold bond scheme was launched on 5 November 2015 and unveiled first Indian gold coin and bullion having national emblem Ashok Chakra on one side and Mahatma Gandhi's image on other side. 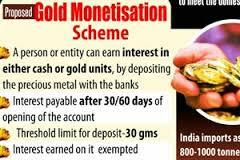 Gold Monetisation Scheme: activate your gold; secure it and earn interest as well. Earn while you secure. Sovereign Gold Bonds Scheme: convenience and security of bonds; empowered by the returns of gold. Invest wisely, earn safely in this scheme. Indian Gold Coin: minted in India with values that make India. Goldcoin bearibearing national emblem Ashok Chakra on one side and Mahatma Gandhi's image on other side. Application for Sovereign Gold Bond Scheme will be accepted from 5 November to 20 November 2015 and the bonds will be issued on 26 November. Buy A .925 Silver Chain Online.